Technically, this should probably be titled 'Baby YARN Crawl'. 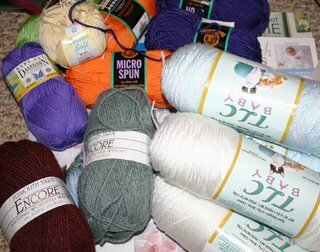 Since I had to go in to Ventura for hide-the-gray day - and I had a 40% off coupon for both Michael's and JoAnn's - I thought I'd look for a book on crocheted baby booties. Found it. Er, found them. 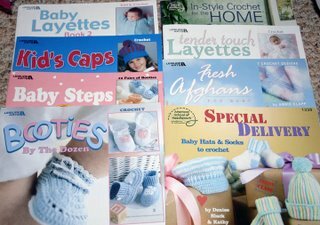 And I needed a book of layette patterns - and baby afghan patterns - and baby hat patterns. Right? And of course I needed yarn to go with all these cute patterns. And since I was hitting every yarn store in town, I stopped in at my favorite LYS. I'm taking a crocheted baby kimono class there on June 24 using the Encore yarn in the photo. I saw the sample for the first time today (I signed up without seeing it. It was crocheted and for a baby; that's all I really needed to know) and it is cute, cute, cute! 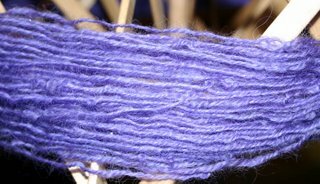 The Baby TLC yarn is for a mile-a-minute-style blanket. The purple Baby Ull yarn from Dalegarn (100% wool & washable) and the yellow Cotton Soft by Mondial are for booties. 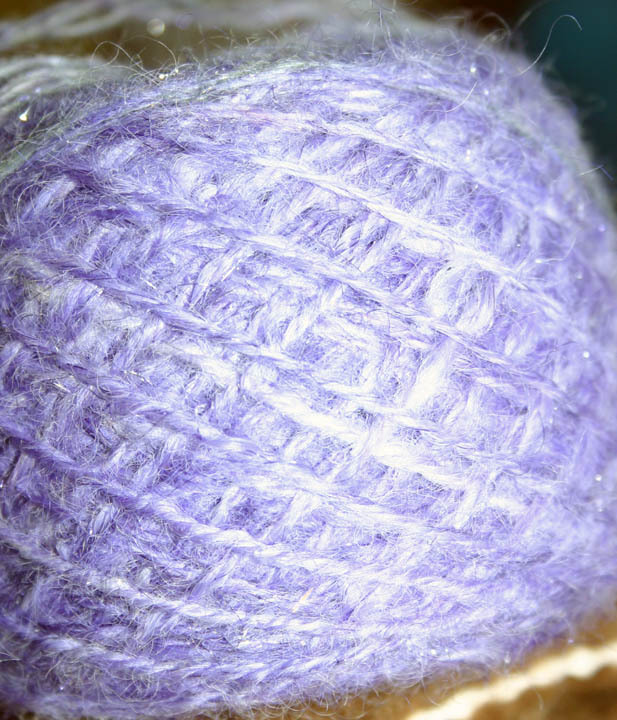 I love the softness and texture of both yarns. 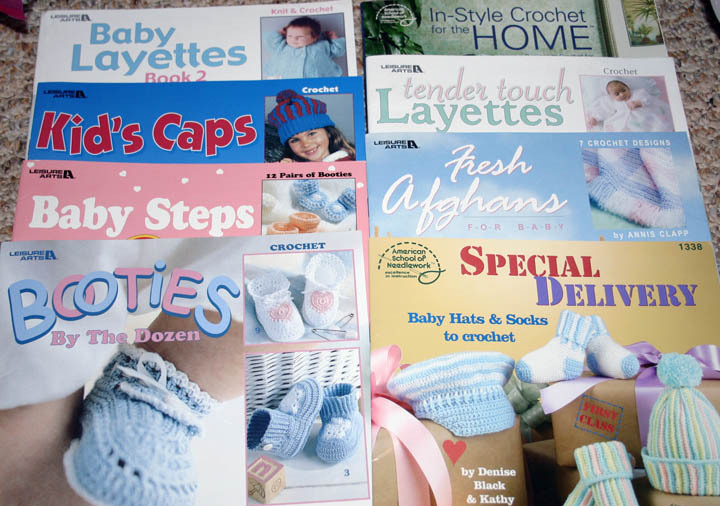 The In-Style Crochet for the Home book (upper right corner of the top photo) is new to me. It has some really great, very unique patterns using a lot of bright colors. I'm going to make the Whoopsy Daisy rug on page 58 into a baby blanket, using the orange, purple and lime green Micro Spun in the photo. Colorful! I actually got some crocheting done tonight. More accurately, I got some frogging done. (You know - rip-it, rip-it, rip-it. Yeah, I know. Corny crochet joke.) I wanted to use my Navajo plied handspun to crochet a hat. I took Kristi's advice and ran the yarn back through my spinning wheel to remove some of the overtwist. It worked on the worst kinks, but now other sections don't have enough twist. Sigh. It was my first try at Navajo plying; it'll be better next time, I'm sure. I got half way done with the hat before I decided that it was way too small. I was on gauge but hadn't figured in the fact that my head is 2" bigger than the "model" head. So I frogged it and started over. I think the size is right this time, but now I'm going to run out of yarn. 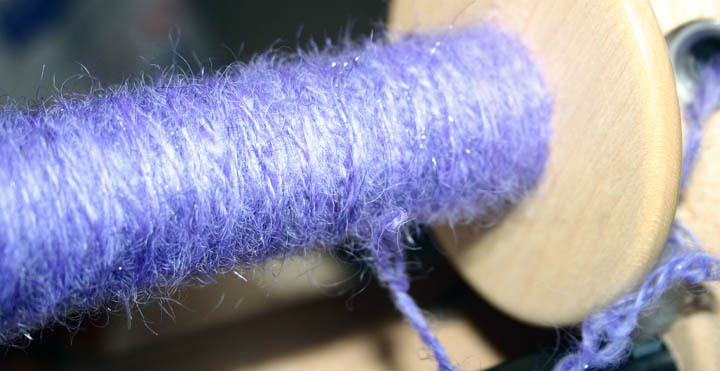 I'll have to spin more tomorrow, ply it, and set the twist using the dryer on 'air'. I don't have time to hang it up to dry since I want to take it to Guild on Saturday and then to the crochet demo at Ancacpa Yarns afterward. Happy 2nd Birthday, Anacapa! And Happy 21st Birthday, Marie!